On June 26th, WLN hosted an event titled ‘Who's Stopping You?' by Apurva Purohit. During the lively two hours, the CEO of Radio City shared her adventures as a working woman. She was funny, insightful, informative and practical and the attendees could all see parts of themselves in the different situations and people that Apurva described. The audience of 28 was a mix of women at various stages in their careers and across age groups and life stages - from young girls contemplating matrimony to young mothers and other more seasoned professionals. 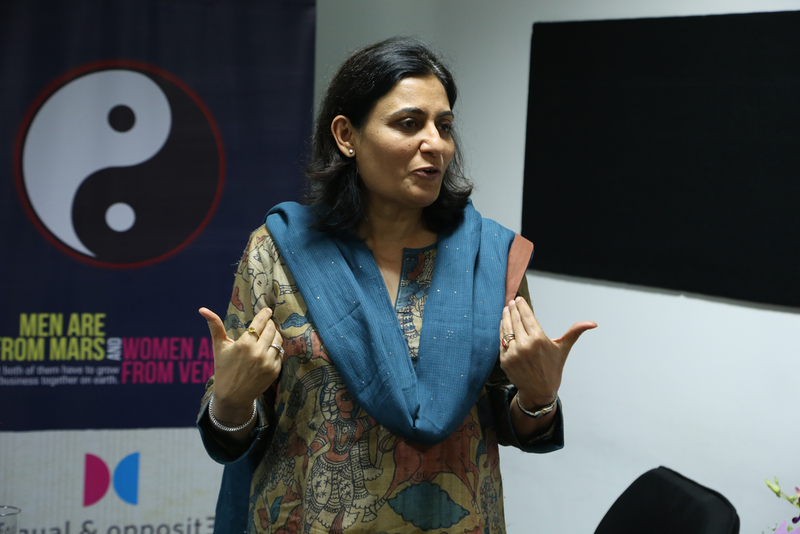 Apurva spoke about the transition that organizations have made from the tokenism of twenty years back to the genuine and forward-thinking practices that many follow today. She discussed how women now need to take ownership of their careers, make thought-through choices to forge ahead with a positive attitude and balance successful careers with fulfilled personal lives. Apurva' s examples and advice was relevant to the Indian woman of today and resonated with the audience. Do you ever hold back a differing opinion, hoping someone else will bring up the objection but nobody does and your opinion goes unheard? Have you ever wanted to give your co-worker sensitive feedback but decided not to because the conversation might not go well or might even harm your relationship? 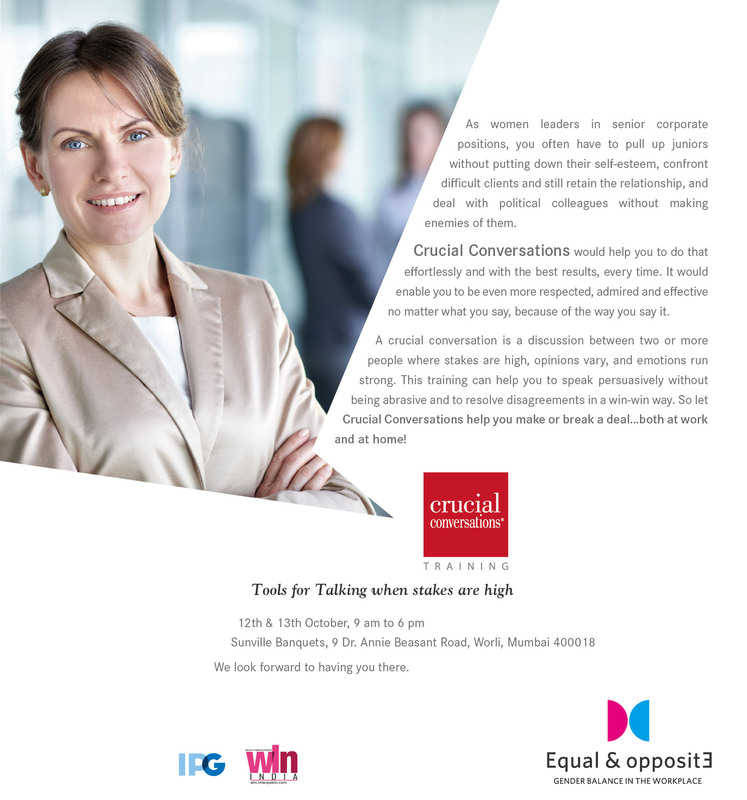 On Oct 12-13, WLN India hosted a workshop and networking event ‘Crucial Conversations’ in Mumbai which was attended by the top 18 women leaders across the 3 IPG companies in India (McCann, DraftFCB and Lowe Lintas). The program allowed participants to learn how to achieve a spirited dialogue at all levels in their organisations, to surface the best ideas, make the highest-quality decisions, and then act on the decisions with unity and commitment. Botox, nose jobs, hair colour and diets. We are always redesigning our looks. But do we ever give a second thought to our minds? WLN India recently hosted a workshop in Mumbai titled ‘Mindstyle Makeover’ which was conducted by Dr. Minnu Bhonsle, one of India’s leading Psychotherapists and Counselors. The workshop was well attended by staff across the IPG companies in India (McCann, Draftfcb and Lowe Lintas). The 4-hour session discussed transformational tools that liberate you to become yourself. The workshop was divided into 2 sections – Psychological restructuring (to change your core philosophies that govern your thoughts, emotions and behavior) and Existential restructuring (to change your views of self, others, and life, that govern self-actualization). Participants learned the actual technology of self-empowerment which they practiced in-session as well as carried away in the form of relevant handouts. We had amazing feedback – ranging from ‘it was a workshop that really made me sit up and think’ to ‘I am taking away insights that will help me personally and professionally’. This workshop was one amongst the many tangible steps that WLN India is taking towards encouraging and enabling women to stay on the career curve all the way up to the most responsible leadership positions. Click to Mindstyle Makeover Event Photos. On December 20, 2011, WLN India hosted a workshop in Mumbai on "Depicting Women Effectively in Communication" which was well attended by staff across the IPG companies in India (McCann, DraftFCB and Lowe Lintas). High-profile speakers at the event included Santosh Desai, Managing Director & Chief Executive Officer, Futurebrand India Ltd; Dr. A.L. Sharada, Director, Population First; and KV Shridhar, a respected creative professional. Half of India is young and impressionable. And as image-makers, we pretty much define how these young people will think when they grow up. Long after our ad has run on TV and been uploaded to an online archive, it is accessible at the click of a mouse. Forever. That 30-second commercial is actually timeless. It lives on for eternity. So if we always depict a girl child as tender and a boy child as tough, we’re perpetuating a stereotype that may have outlived its era. If we depict women as either saints or sirens instead of a realistic mix of both, we’re creating avatars that simply don’t exist! All it takes is a little awareness running as a background track in our minds. 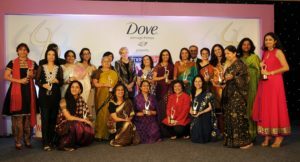 ASIA-PACIFIC – OCTOBER 2011: Kavita Lakhani, president of LinOpinion India and co-chair for India of the IPG Women’s Leadership Network, was presented with the award for ‘Leading Woman in Media’ at the 2nd Annual Women in Leadership Forum India in Mumbai on October 13 to 14 2011. The WIL forum is a dynamic platform for the growth of business women from all backgrounds, industry sectors and locations around the world. More. By dint of hard work, foresight, generosity of spirit and an enviable derring-do, these women have made the No. 1 spot their own. Some new names, some names that we can never ignore, each of ‘SAVVY’s’ 27 chosen women are powerful change-makers whose influence continues to dominate India and beyond. When she moved from marketing to client servicing and account planning with Lintas, Sudha Natrajan didn’t just move cities but into a whole new realm of responsibilities of managing, growing the group and innovating to stay ahead of the curve. Since then the good times have flowed unabated, with many credits too, notable being the Gold ABBY for Britannia 50-50 a few years ago, when Sudha was heavily pregnant. Now a mother of a son, Sudha has championed the cause of young working mothers, offering them flexi timing, and even offering a spare cabin on those days when help at home is not available. 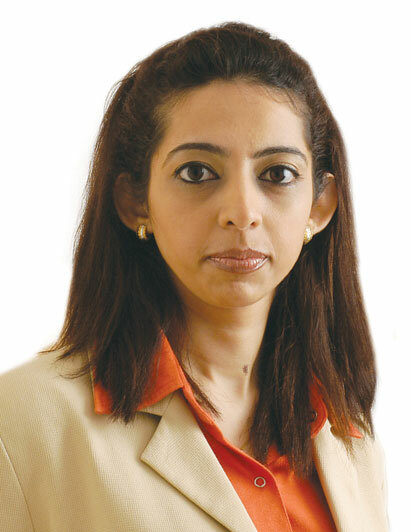 Says Sudha: “I refuse to lose good talent because of the demands of motherhood.’’ From planning to become a doctor to now being one of the foremost women in the challenging realm of client servicing and account planning, Sudha says she has no regrets. She would have made a compassionate doctor, but today she feels she is more attuned to the demands of an agency. For this feisty woman who is proficient, positive in her approach and has a keen eye on growing the profits of her company, the inspiration for success comes from within. Not because there is a paucity of heroes around her, but that’s just the way it is. A woman who knows her mind and is not afraid to speak it.